Zamalek claimed their fifth straight Egyptian league win under manager Ehab Galal after coming back from one goal down to beat rock bottom Nasr 2-1 at Cairo Stadium on Thursday. The Whites fell behind to a 15th-minute penalty from Nasr striker Mohamed Hassan ‘Mido’, before hitman Kabongo Kasongo draw them level two minutes past the half-hour mark. Center-back Mahmoud Hamdi headed his side in front in stoppage time of the first half, as Zamalek failed to add further goals against the league’s basement side throughout the second period. Zamalek climbed second of the league table with 48 points, two ahead of Ismaily who have two games in hand. After 14 minutes where Nasr were arguably the better side despite leaving Zamalek’s backline free on the ball, the hosts were awarded a penalty following what was adjudged by the ref a foul by center-back Mohamed Abdel-Ghani. Forward Mido stepped up to take the penalty, and capitalizing on keeper Ahmed El-Shennawi’s ill-fated decision to go early to the left, Mido struck the ball to the right giving his side the lead. The bottom side could have easily doubled their advantage if it wasn’t for a superb save from El-Shennawi, after Ammar Hamdi went one-on-one with the keeper following a dreadful back-pass by Egypt midfielder Tarek Hamed. Nasr were also controversially denied another penalty shortly afterwards, but it was the Cairo giants who got back into the game quickly through striker Kasongo with a well-guided header inside the area following a cross from Abdallah Gomaa from the right. Zamalek made sure they went into the dressing rooms in front with another header, this time through center-back Hamdi, who managed somehow to find the net with the back of his head to make it 2-1. The second half was largely an eventless affair, with Khaled Eid’s Nasr continuing with their same strategy; defending from the center circle while leaving the Zamalek center-backs possession. And minutes after the break, Gomaa was guilty of squandering a gilt-edged chance after Ayman Hefni’s blocked strike from outside the area fell into the winger’s path who curiously dragged his effort wide. 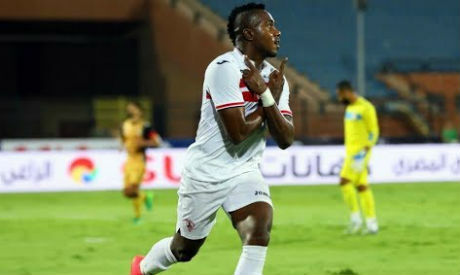 Zamalek continued to boss possession, albeit without posing real threat on goal, with midfield wizard Hefni showing glimpses of his superb dribbling skills and ability to keep the ball under pressure every now and then. But Nasr striker Mido could have come close to scoring late in the game when his effort from inside the area was saved by keeper El-Shennawi, who was again tested by Mohamed Hasan three minutes from time, as Zamalek claimed vital three points in their bid to finish second of the table.